RIO GRANDE, Puerto Rico – D.A. Points was never better at the start, and good enough at the end. 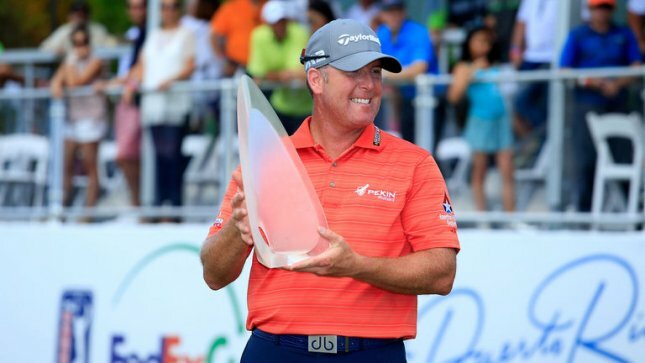 Points opened the final round of the Puerto Rico Open with five straight birdies, and then overcame a rugged stretch by saving pars and piling up enough birdies for a 6-under 66 on Sunday and a two-shot victory. It was the third PGA Tour victory of his career, and felt just as sweet as when he won at Pebble Beach with Bill Murray as his partner, and four years ago at the Houston Open to get to the Masters. This won’t send him to Augusta National because it was played opposite a World Golf Championship. It was no less important for Points, who lost his card a year ago and now has a full two-year exemption. Two-time U.S. Open champion Retief Goosen (64), Bill Lunde (68) and former U.S. Amateur champion Bryson DeChambeau (67) tied for second at Coco Beach Golf and Country Club. Sam Saunders, one week after missing the cut at the first Arnold Palmer Invitational without his grandfather there as the host, closed with a 65 and tied for fifth. Also tying for fifth was former U.S. Amateur champion Peter Uihlein, who plays the European Tour and was in Puerto Rico on a sponsor’s exemption. That sends both of them to the Houston Open next week for finishing in the top 10. Six others in the top 10 were eligible for the Houston Open, where the winner gets an invitation to the Masters. Chris Stroud, with his first 54-hole lead as he tried to win his first PGA Tour event in 277 starts, closed with a 71 and finished four shots behind. David Hearn (68) of Brantford, Ont., tied for 17th at 14 under and Ottawa’s Brad Fritsch (67) tied for 44th at 9 under. Points closed with a birdie to finish at 20-under 268. And then it became a grind. He dropped a shot at the sixth, another at the eighth and then a third bogey at No. 10 when he three-putted. But he saved par at No. 11 and faced another 5-footer for par at No. 12. Even though the victory doesn’t get him into the Masters, Points will be at The Players Championship in May and the PGA Championship in August, along with access to smaller fields like Colonial and the Memorial. And he starts out next year on Maui at the Tournament of Champions.